By Charlotte Orba on February 27, 2017 in Reduce your plastic use! In February 2016, I had the idea for Team WiseOceans to give up plastic for Lent. Very quickly it became crystal clear that the term #plasticfree can be widely interpreted, difficult to achieve and slightly addictive. As instigator of this challenge I felt duty bound to lead by example and in so doing, found myself engrossed in the task and became an enthusiastic plastic (free) preacher. Not that I’ve achieved anything close to a #plasticfree or #wastefree life (no mason jar of waste for me yet) but I have made changes that have stuck and I have convinced others to make changes too – possibly the best thing to have come out of this. For some years, I’d already picked the low hanging (but important) fruit of not using disposable water bottles and shopping bags, but was I able to branch out and make permanent changes to other areas of my life? 1. 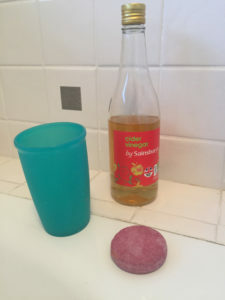 Hair washing: I now use a shampoo bar and rinse with apple cider vinegar (1 tbsp. in 1 cup of water). My hair looks and feels more or less the same. The longer I did it for, the better it felt. (side note: I’ve also ditched liquid hand soap and use regular soap which is fairly easy to find plastic free and does just the same job. Hint: get a good soap dish that has a drain to make your soap last longer). 2. Deodorant: This was a surprising success. 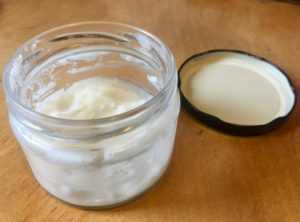 Not to get too personal but I do sweat and I thought a home-made product would never work. My recipe is super simple. 3 tbsp. coconut oil (melt in a double boiler), add 1 tbsp. of corn flour, 1 tbsp. bicarbonate of soda, a few drops of tea tree essential oil and maybe something like lavender to make it smell nice. Put in a clean jar and cool (stirring every now and then to make sure it doesn’t separate out). In the summer, I add a tbsp. or so of beeswax to stop it melting too much. Then just a pea size amount melted onto your skin and hey presto – no smelly armpits! Give it a few days for your body to adapt before you give up. It’s not an antiperspirant though and there have been times when it’s super-hot and just more practical to use an antiperspirant but it’s the exception rather than the rule and happening less and less. Not everyone gets on with the bicarb. A quick search of the web will show you some bicarb free options though. 3. 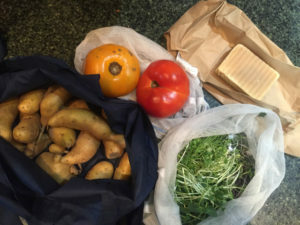 Produce bags: Taking reusable shopping bags has been in my DNA for well over a decade but I hadn’t thought about produce bags for when you buy loose veggies and fruit (in many cases you don’t even need a bag anyway!). I bought some Onya Weigh bags which are now a permanent fixture in my handbag. I get so many questions and compliments when using them. I also made my own out of old (clean) shower scrunchies. Simply unravel, cut to size and tie a knot in the end. I know! I was amazed too! 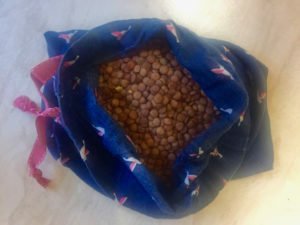 Finally, when I was looking for a way to repurpose/upcycle some worn out pyjamas I made some fabric produce bags – perfect for my trips to the bulk store. 4. Being prepared: I will admit that I changed up to a slightly bigger handbag to accommodate this – but it’s still not as big as many are. Single use plastic is of course the handy solution to all those times you didn’t know you were going to need a drink/cutlery/straw/something to take something home with. There’s a reason why it’s ubiquitous. However, now I’m like Macgyver (or Mary Poppins?) 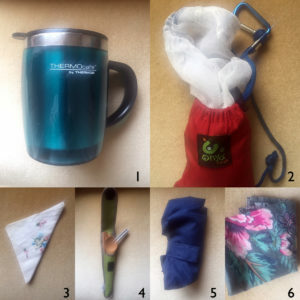 – ready for anything and able to provide a #plasticfree solution from the contents of my bag. 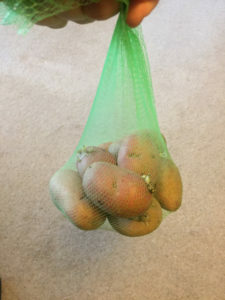 This is what I have with me in my bag and it seems to work well. 5. 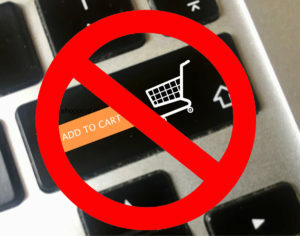 Buying/consuming less: I would say that this has probably been the most important outcome of this experiment. The easiest way to consume less plastic is to consume less things! ‘Do I really need it?’ is now the first thing I think about when I think I need to buy new things. Not only ‘Do I need it?’ but also ‘Can I get it second hand?’ and ‘Can I borrow it?’ Not to mention I now think about – ‘How long will it last?’ and ‘Can it be fixed if it breaks?’. Now I have bought new things – including some spur of the moment things I’ve regretted – but I do TRY to give myself 24 hours to think about it before I order something. It’s work in progress, but more often than not I end up not buying it. 6. 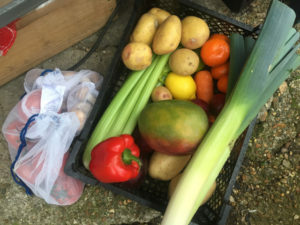 Buying local I’ve been surprised as to how much plastic free shopping you can do at the supermarket (use your produce bags to buy loose fruit & veg, take your lidded pots to the deli counter to buy cheese and meat) but finding markets and coops that sell local produce can kill 2 birds with one stone. Very often their produce is plastic free AND you’re supporting local producers. 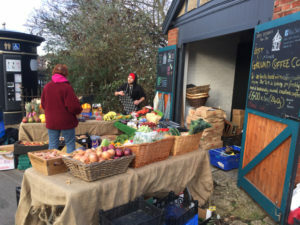 I’ve recently moved house and am delighted that we have the amazing ‘Veg Shed’ just around the corner – local fruit & veg, eggs, honey, oil and locally roasted coffee. Not all strictly plastic free but generally very good and better than most places. They also take in some recycling that our local council doesn’t take. 7. Milk bottles: It’s like going back to being a kid. 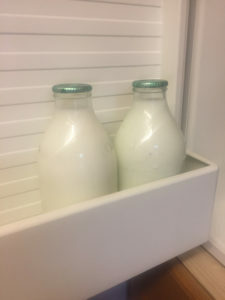 Milk bottles delivered to your door and empties collected. The original circular economy. I get a kick every time I see the bottles in the fridge. Yes, it is more expensive but not prohibitively so. I’ve also decided spending more on better products, plastic free products, local products and higher welfare products is more than outweighed by buying less ‘stuff’, being good about using up all my leftovers and the general warm fuzzy feeling that you are at least trying to do something positive. 8. 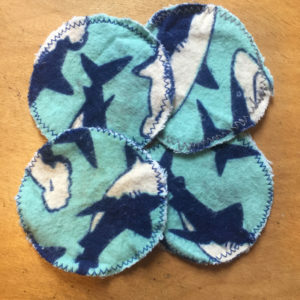 Embracing my inner ‘craft’ skills: I make no bones about it, I’m not a naturally ‘crafty’ person but I’m now the owner of a very small and very basic sewing machine with which I’ve repaired a tear in a t shirt, made some produce bags and made some more reusable make up remover pads. #Proud. 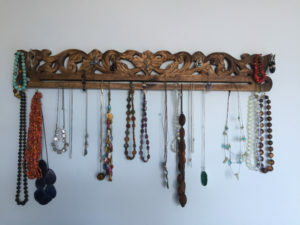 I’ve also repurposed a piece of decorative wood to make a jewellery hanger for my wall. I don’t think I’m quite ready to open an Etsy shop but there’s definitely a shift in my attitude in that I think about what I already have and how I can adapt, repurpose or repair it instead of buying something new. 9. 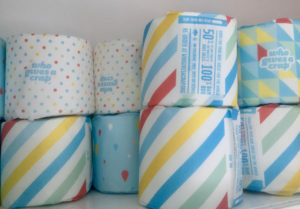 Toilet Paper: We all use it but it’s pretty much impossible to buy plastic free. At least it was until ‘Who Gives a Crap’ started shipping to the UK recently. This Australian company make toilet paper out of bamboo fibres and ship it plastic free. They also donate 50% of their profits to help build toilets for those in need. Win Win! It’s competitively priced too as well as being just as nice as the brand I bought before – and no I’m not being paid by them to say this! 10. Cleaning the house: It’s a bit of a cliché but bicarbonate of soda really does clean most things around the house. I invested in a big bucket of it and use it regularly for all kinds of jobs. 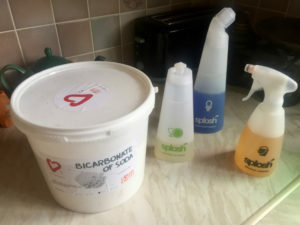 The person I live with isn’t quite ready to give up on some of the more normal cleaners so I’ve found ‘Splosh’ – a company that provides concentrate solutions by post AND you can send back the packaging to be reused. We live in the real world with real stresses and strains. I’ve moved house in the last year and put a lot of effort into clearing out with a conscience. Items were re-homed, sold and donated but there were still far more items taken to the landfill than I would have liked. In the end, time pressures won out and you just have to get things done sometimes. I’m also living with another person now and while they are a willing convert to the cause I don’t have 100% influence over them and items come into the house that I might not choose myself. In some cases, I am still using up old supplies (cleaning, cosmetics, beauty products etc…) so I haven’t yet fully explored #plasticfree options. I could get down hearted about it but I remind myself that I’m doing more than most and it all makes a difference. Just by attempting it means you talk about it, which means you’re communicating the problem to others and hopefully influencing more people to take the #plasticfree plunge. I whole heartedly recommend it! Can you get the plastic free loo roll in a recycled paper version? The loo roll itself, I mean.